Guatemala City is often written off as a place ridden with crime, grit and dangers lurking, but if given a chance it has many charms and sites to offer. 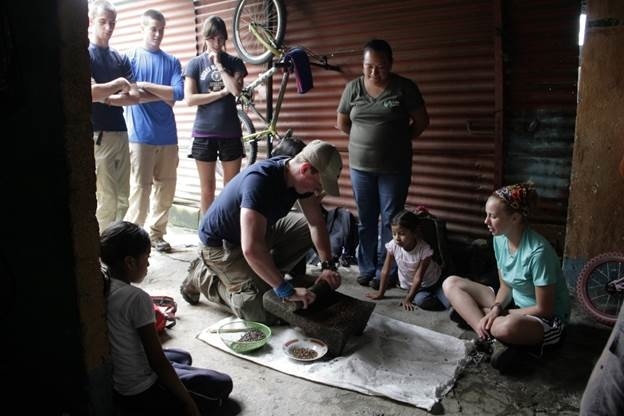 OG Guatemala Extreme hopped off of the plane ready to share the dream of Guatemala. Despite exhaustion from a long day of travel from their home countries, participants spent a day exploring the central market, ate their first of many typical meals together in a local comedor, played an epic OG game called NINJA! in Parque Central—and even made a local friend who joined in on the fun. We toured the streets with cameras in hand to seek out graffiti on the walls that share a deeper story of disappeared persons, genocide and a thriving underground Guatemalan counter-culture. We found ourselves dancing to the sounds of a Guatemalan marching band in the pedestrian-only streets in Zona 1– the historical and cultural epicentre of Guatemala City and a popular tourist destination where artists thrive and hawkers lurk. Donde Estan? 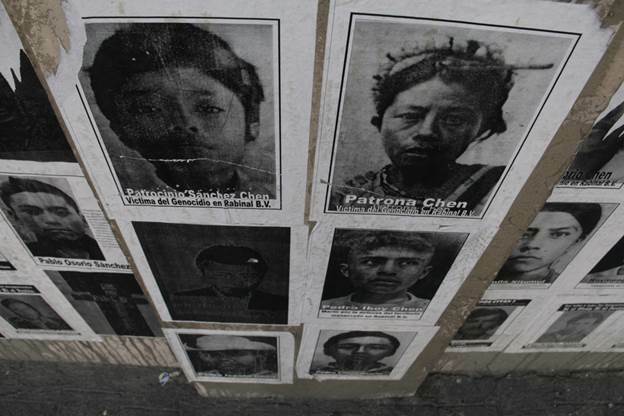 Pasted faces that line the street walls with disappeared persons gives just a glimpse into the tragic history of those who were disappeared during Guatemala’s 36-year civil war. The next day we made our way to the Canadian embassy for a review of the past and present politics, and socio-economic issues facing the country. We then walked around the upscale Oakland mall where carousels and countless shops overwhelmed our senses (we’re all about contrast here), and made a visit to the infamous relief map where we visually scaled the rivers, volcanos and mountains that lay ahead in our Extreme adventure. After a one hour micro-bus ride away, we found ourselves in the colonial Antigua city for a quick tour (and delicious burritos at our favorite local spot) before exiting Guatemalan Disneyland to hop on our very first chicken bus ride! OG art from coffee beans! We rested with our friends at As Green As It Gets (AGAIG) in the silent ‘pueblo’ of San Miguel. In the morning, by stepping into the fields of Rogelia- one of the two women in the cooperative- we learned about fair trade politics, the benefits of direct trade, and Roya; an endemic coffee rust that has destroyed the crop, market and lives of those dependent on it here. Listening to her stories, it was obvious how much hard work, time and labor is placed into every coffee plant, as well as the help the cooperative has offered by teaching members how to turn coffee into a higher value business. 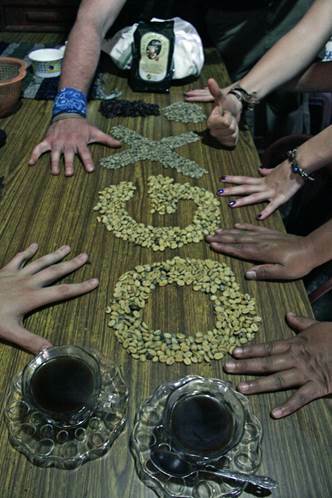 Cafe Oro, literally translated as gold coffee, is a stage that most farmers leave out in the coffee production process because it can seem lengthy and involves drying and de-husking the beans, yet it adds a significantly higher value to the final product, and the winnings of the individual farmer. Rogelia’s involvement with AGAIG has taught her to learn how to be an independent business owner, support her family, and sell café Oro from which she has seen the results. Her oldest daughter is now on her way to receive higher education as a chef, something that was otherwise unfeasible before.